My latest release is the third book in the Saddle Creek series with a setting in a small town of Saddle Creek, just outside Jackson Hole, Wyoming, in the shadows of the Great Teton Mountains. The premise of the series is of four young men, loyal friends throughout high school but once graduated they all go their separate ways—one to college, one bought the horse ranch he’d worked on most of his life, one joined the military, etc. Now, since they’ve matured they return to their roots and climb mountains to overcome many overwhelming challenges to meet and keep the loves of their lives. Dillon Davidson wants to advance in his military career but didn’t plan on having to kill so many people to do so. On a Special Opps mission he’s captured and tortured for eighteen long months. 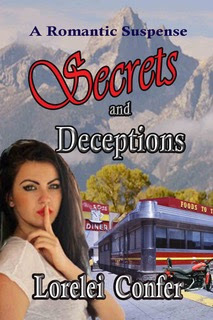 After his escape, he ends his four-year career in deception. He wants to start over with his soul mate, Avri in Saddle Creek, Wyoming. I live on a densely populated peninsula on the mid west coast of Florida with a cat Mogwai, and AJ, a long-haired Chihuahua. In the fourth grade, I wrote a story in the form of a play—something about getting a shot at the doctor—that actually was produced by the teacher for parents and students in an assembly. When I was older, I spilled my guts in a journal every night and wrote long newsy love letters to Viet Nam to my high school sweetheart, now my husband. I am a multi published author of Romantic Suspense having written and completed at least nine books, two series and a compilation of four short Christmas stories: Christmas Awakenings. Mentoring children fifteen years ago, began my phase of helping others, mostly children in third and fourth grade, teaching the importance of using the correct words for a 100 word essay, and watching their eyes light up when they figured it out. Since then, I have mentored aspiring authors to set goals, write at least 100 words every day to increase their word count, complete scenes, chapters and generally, meet their objectives. All titles are on my website: www.loreleiconfer.com.